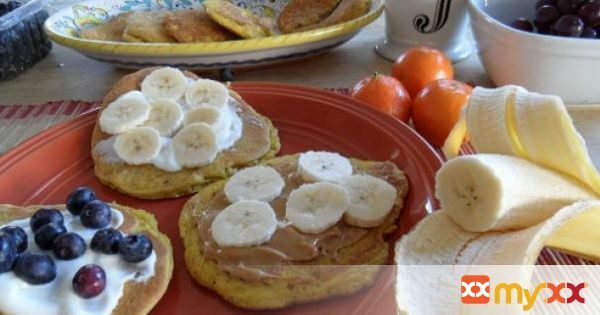 Delicious protein and energy-packed pancakes made with almond flour and chopped walnuts. This recipe is perfect for athletes and the wheat averse. 2. Add your dry ingredients, including chopped walnuts and allow the pancake batter to sit for about 5 to 10 minutes. 3. Heat a large skillet over medium-low heat. Place a dollop of butter in the skillet and spread it around. 4. Because we are using almond flour, I suggest making small pancakes because they are much easier to flip when they are small. 5. Spoon out small portions of batter into the skillet (you should be able to make 3 at a time) and allow pancake to cook about 5 to 7 minutes before flipping. 6. Allow pancake to cook an additional 3 minutes and serve with your favorite toppings!